Yes Conrad, that is an excellent finish on the T34. The mud looks great. Mark, the IV is coming along a treat. The screens are really going to be worth the effort you have put into them. The weathering looks wonderful but you need to do the same to the decals. They really stand out and show no sign of wear as the rest of the vehicle. Thanks for the comments guys, I'm planning to tie the decals in by chipping over them and streaking some grime and rust across them, should work ok. Calling this one done. Went with a look of a fairly newish vehicle so its dirtyish but doesn't have chipping etc. Was pretty happy with this kit overall. Nice one Rory.... not monotone but not hidden under a ton of slop. Looks like it just rolled out of the plant onto the front line, which actually happened in Stalingrad I have been told! I am trying to tone down my weathering in regards to chipping and wear in general. Looking at photos of the real vehicles in action I seldom see the level of chipping that we see on model kits. Also I figure a wartime T34 had such a short shelf life it wouldn't have had time to get major wear and tear on it. Very good work with T-34. I like. There is finesse in the weathering of the model. I sometimes get involved. Very nice finish on the your T-34. 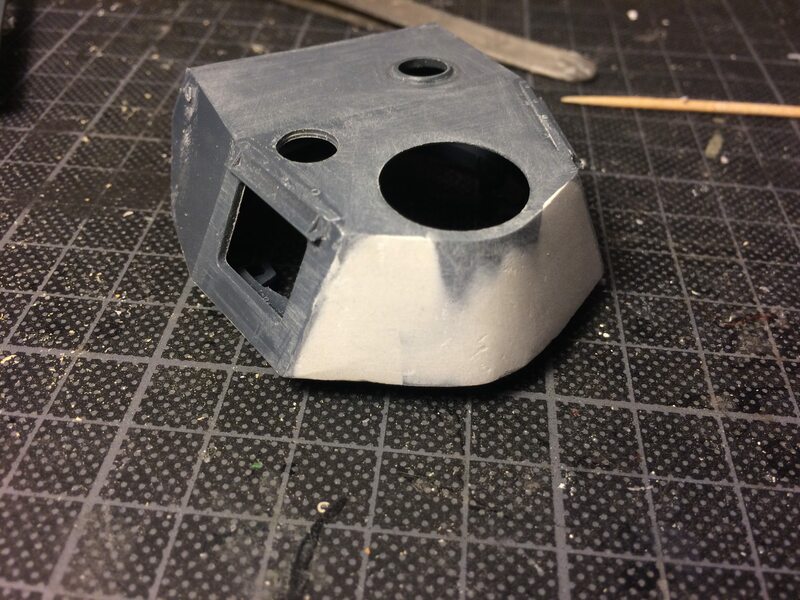 I agree with your thoughts on weathering for those tanks. I was just wondering what a T-34 would look like after being put back into service after it was knocked out in battle. I read that many T-34s were repaired 4-5 times and sent back into battle. I was reading were one T-34 was knocked out and repaired 4 times during the battle of Kursk. Did they look like they came out of the factory or did they just patched the shell hole, repaired the inside and spayed on some paint? They couldn't have time to straighten fenders and such. 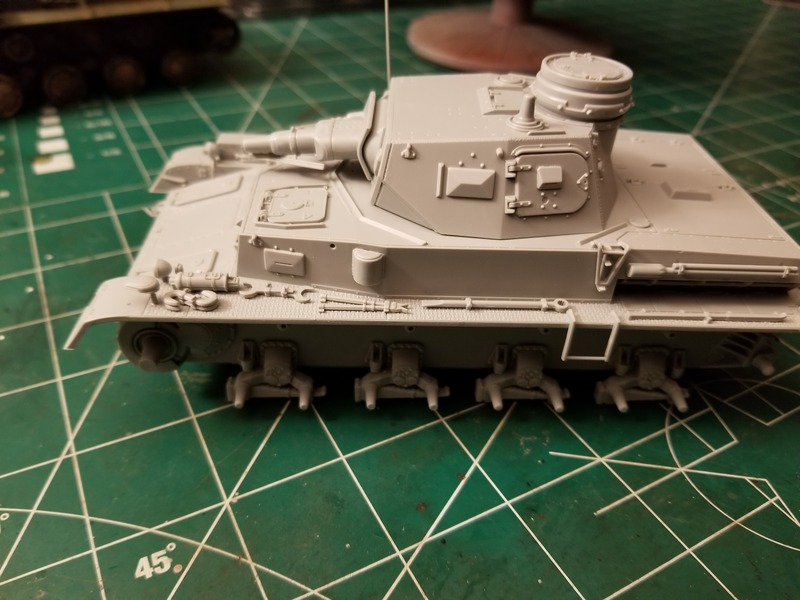 My Panzer IV Asuf. D is all put together now. This Dragon/Platz kit was super easy to put together, it is more like a Tamiya kit than anything made by Dragon. 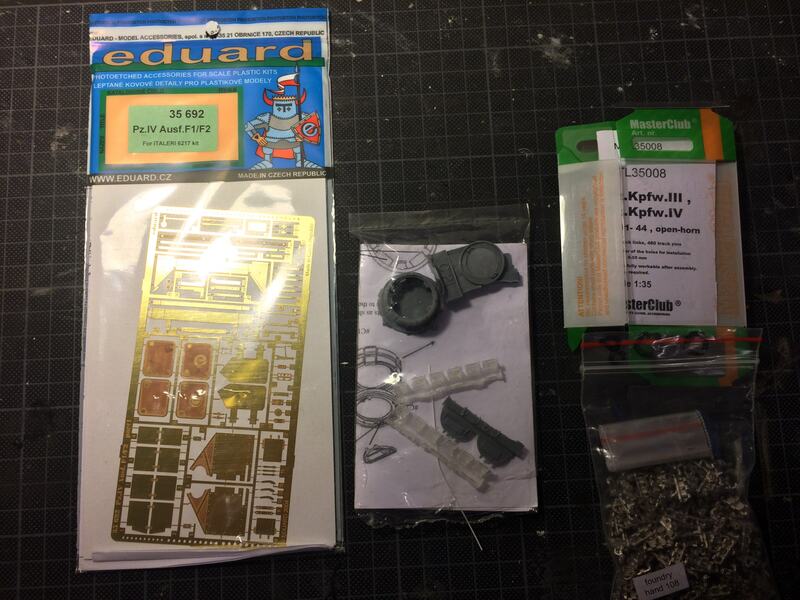 There will be a very small amount of putty used as well, the fit is superb. I recommend this kit if you want an quick and easy build with some great detail. Calling this done for the time being, may add the figures later, and will post photos if I do. The weathering is a bit overcooked I realise, but I wanted to do this one in an almost cartoonish style, it's a lot of fun that way. Decent model, if I were to build it again I would add PE screens though, otherwise pretty good for only £16 + the Miniart tracks. I am in with this. Nice finish with your T-34. I wouldn't say the weathering was over done. A lot of those T-34s were repaired many times over and used again. With all of the rain and miles traveled I sure many were in the same condition. Again nice work and nice looking T-34. Thanks Mark, kind words. My t-34 is definitely one that's seen better days! Conrad, your T34 is a masterpiece. Beautiful work. I finally got a little time to continue on my build. All the major sub-assemblies are now complete. Lower Hull - Drive sprockets are not attached yet. Just dry fitted until I have the tracks completed. Has the wrong exhaust system for a Sep '44 build, but didn't have another option available to me. Upper Hull - All the tools and equipment is now attached. Next task is putting these together. 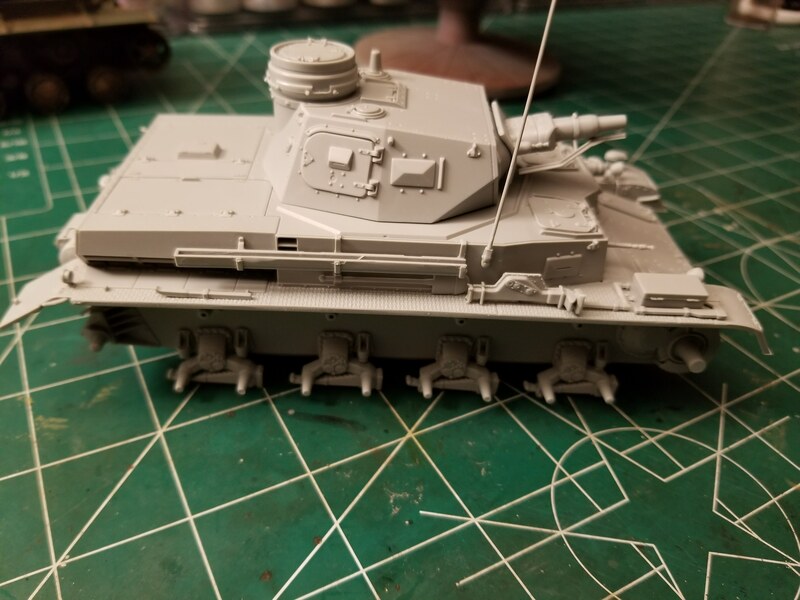 99 links per side, as on the real tank. 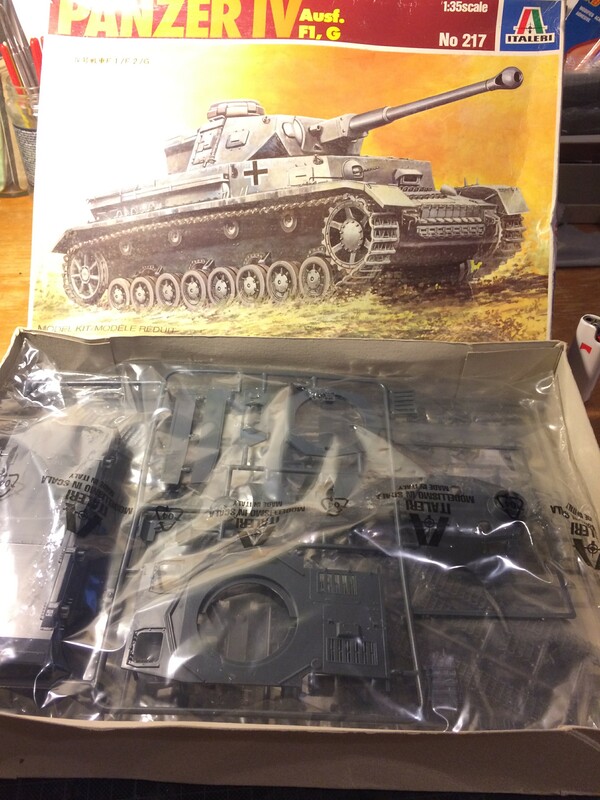 I’m joining with the Italeri panzer iv. I’ll do it as the F2 variant. 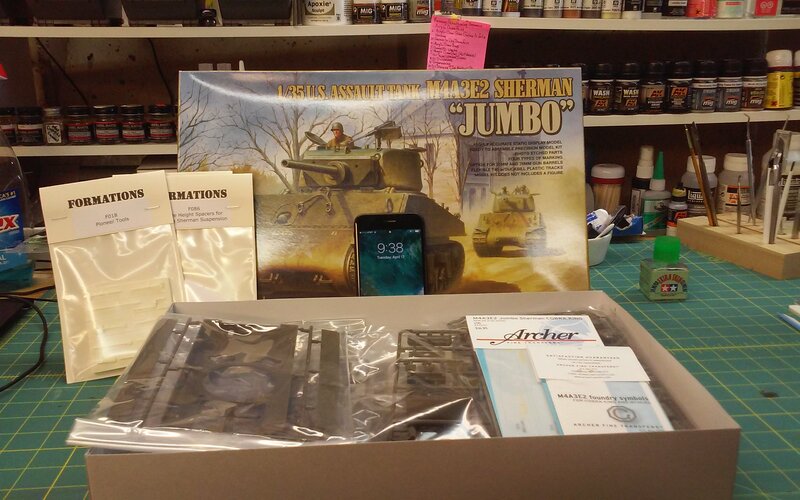 Here is my start up photo and and photos of the AM bits and pieces I’ll use to spruce it up. So now time to start scraping away the weird extra armour Italeri added to the rear of the turret! Thanks for the kind comments guys, much appreciated! Those zimm decals look great painted Mark, not tried them before, been meaning to give them a go. Matt the 4 is looking a treat. Conrad, excellent result on the T34. Love it. 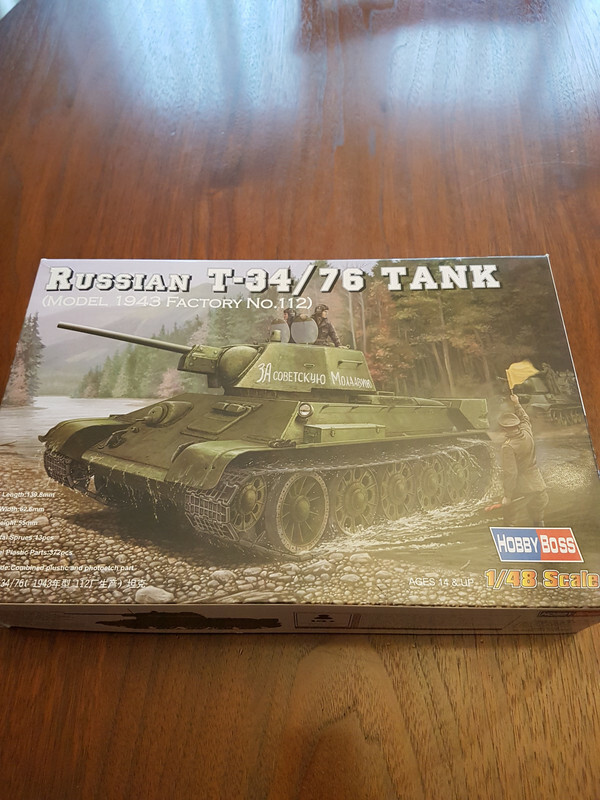 The 2 finished T34's here are what modelling, and joining Group Builds is all about. Have fun, and build and paint the way you want it, not what others believe they should be. Each has a different view, but both are fantastic builds and ones anyone would be proud to have pulled off. Congrats guys. Excellent looking stuff so far guys. I hope I can live up to them. 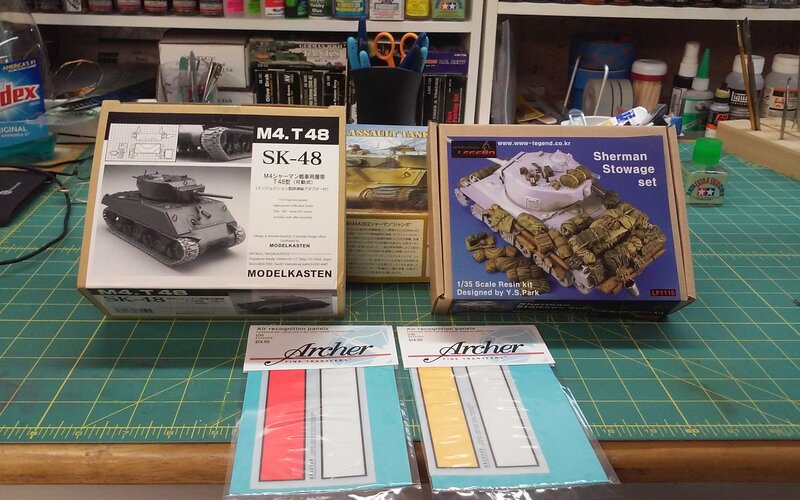 My first campaign contribution is going to be Tasca/Asuka's Sherman Jumbo done as Cobra King with Archer decals and casting symbols and Modelkasten duckbill tracks (I'm a glutton for punishment). Going to use Legend's stowage set and Archer's air recognition panels, also. I apologize in advance for the potato quality photos. I've assembled the left track. All Panzer IV's, A through J, had 99 links per side. So, I assembled 99 links. This is the result when test fitting 99 links. This now looks correct. Just a bit of sag between the return rollers. Next, need to do the right side. Then prime and paint. 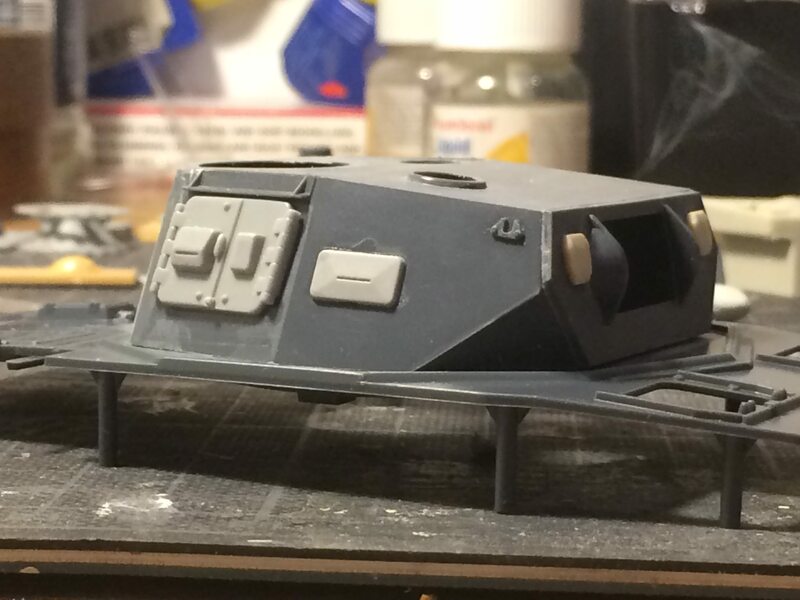 Progress on the Italeri panzer iv f2… I decided not to scrape away the extra plastic on the rear of the turret, but add miliput to make the armour plate flush. 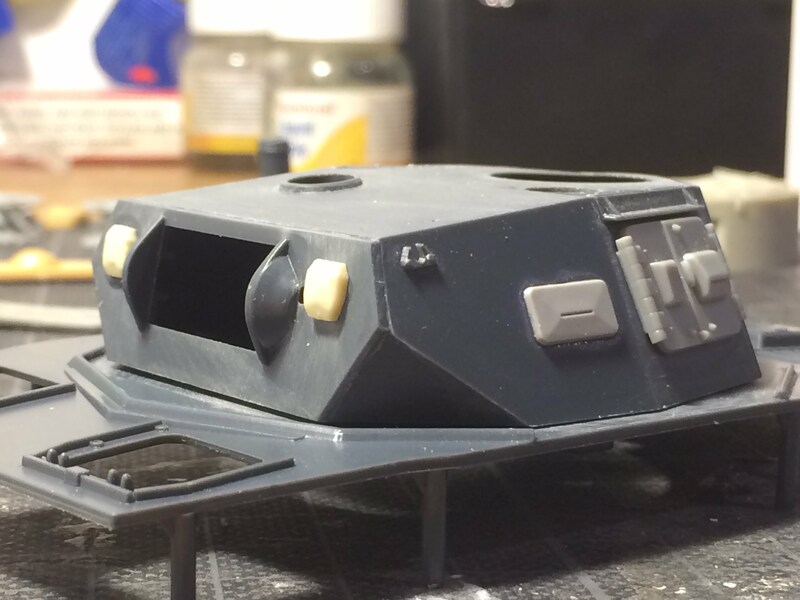 I swapped the vision ports and turret hatches for spares from a Dragon kit… And the ports on the front of the turret are resin castings based on a Dragon kit part. I had to, as the Italeri kit only comes with one and the f2 had two of them. The Friulmodel tracks are primed, painted, and installed. Nice updates to the turret. 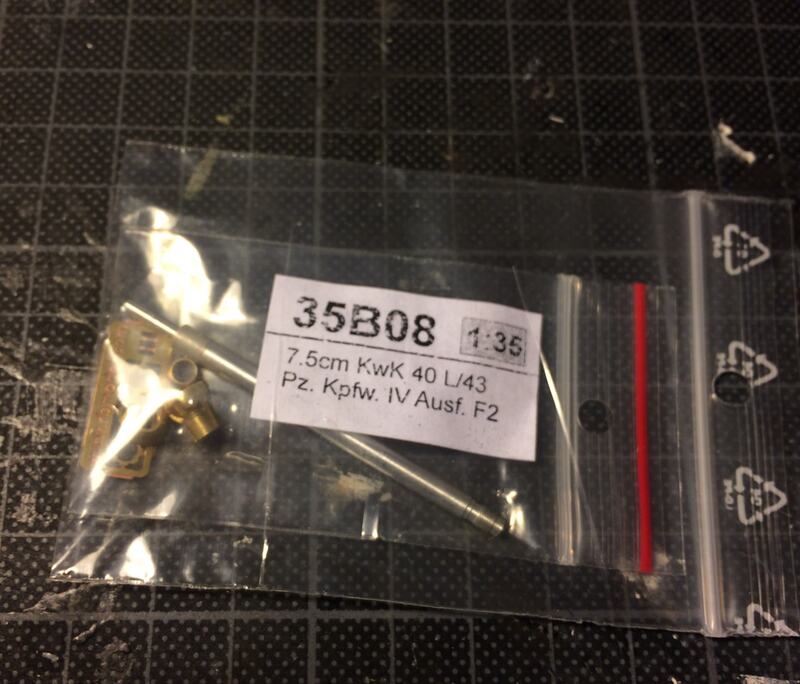 It is amazing how many spares you can get from a Dragon kit. Gotta love the looks of metal tracks. They sure beat the looks of rubber band tracks. The upper hull is now attached.